The Goods and Services Tax Council on Sunday decided to slash the levy on under-construction houses to 5% with a special rate of 1% introdu. The Goods and Services Tax Council on Sunday decided to slash the levy on under-construction houses to 5% with a special rate of 1% introduced for affordable homes but opted to withdraw the benefit of tax credit on inputs such as steel, cement and paint, arguing that builders were pocketing the gains. A house with a carpet area of 60 square metres (around 650 square feet) in a metro city and 90 square metres (970 square feet) in non-metros will be put in the affordable category if it costs up to Rs 45 lakh. “The GST Council has accorded big relief to the real estate sector… This will give boost to housing for all and fulfil aspirations of neo-middle class and the middle class,” finance minister Arun Jaitley said after the decisions were cleared by the council. Houses which receive construction certificate do not face GST and homebuyers only need to pay the stamp duty for registration. The GST Council’s decision will benefit buyers who are currently on construction-linked payment schemes but not those who have already made 95% down payment. Niranjan Hiranandani, national president of National Real Estate Development Council (NAREDCO), an industry body, said the move will have a positive impact and is expected to bring relief to home buyers and narrow down the demand-supply gap. Supertech chairman RK Arora was, however, disappointed with the government’s decision to withdraw input tax credit. 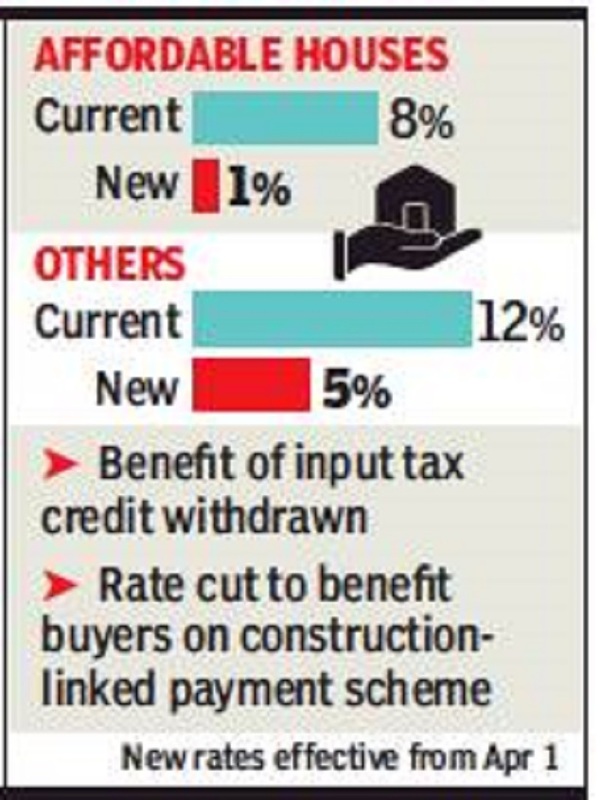 Tax consultants warned that there may be some price hike in the coming weeks as builders would like to cushion the blow of withdrawal of input tax credit. “As expected, the GST Council has cleared what looks like a ‘quick fix’ solution to the perception that the industry was not passing on the benefit of input tax credit to customers, just like restaurants. It’s good that April 1, 2019 has been agreed to be the date when the new rates become effective, which gives some time to industry to assess the impact and work out the new prices. Developers would need to increase the base price to recover the loss of input credit but would need to be cautious given the surge in anti-profiteering investigations for restaurants, in similar circumstances,” said Pratik Jain, partner and leader for indirect tax practice at consulting firm PwC. On March 10, the GST Council will decide if a small portion of commercial space in residential complexes which are used for shops will also get the tax benefit. In addition, it will consider if lease premium, FSI transfer and some of the other charges will face GST or not. A decision on GST on lottery was deferred by the council as a ministerial panel will hear the arguments of Kerala and Punjab before taking a final decision.